Can I really learn to dance from a dance video? Absolutely! The main thing you don’t get with dance instruction on video is feedback from an instructor. How does renting from DanceFlix work? Once you become a member, you can select your dance DVDs from our online catalog. We deliver the DVDs to your home by first-class U.S. Mail service. Shipping is free, both ways. Keep the DVDs as long as you like, there are no due dates or late fees. When you're done, simply return the DVDs in the prepaid mailer and we’ll send you the next one. You can have anywhere from 1 DVD to 3 DVDs out depending on your plan. Visit our Plans and Pricing page for more information. Please see our BBB Business Review with the Better Business Bureau. We have no record of complaints and plan to keep it that way! We accept credit cards from Visa, MasterCard and American Express. DanceFlix ships to all 50 states and U.S. Territories, including Puerto Rico, Guam, American Samoa, the Northern Marianas and the Virgin Islands. We also ship to APO, FPO, and DPO addresses. Due to the far distance of these locations, delivery times may take several additional days. If you encounter any shipping delays or lost/damaged DVDs, please login to your account and go to "My Queue" to notify us. You may also email us at info@danceflix.com or through our "Contact Us" page. We will do our best to resolve the issue. Be sure to use the “search” box on the home page. You can search by title, instructor or dance style. If you would like us to carry a certain dance video, please let us know by emailing us at info@danceflix.com and we will do our best to acquire it. To reactivate your account, go to the following link: Reactivate Account. After entering your former login and password, you will need to enter your credit card information. Next, navigate to "My Rental Plan" to select a rental plan. For your security, we do not store credit card information for our inactive members. If a DVD has been lost or damaged while in your possession, you will be charged for the DVD. You can notify us by logging into your account and going to the "My Queue" section or email at info@danceflix.com or through our "Contact Us" page. It’s been over 7 days and still no DVD? If the U.S. Postal Service lost the DVD, you will not be responsible. Notify us so we may ship you a replacement DVD. If the DVD eventually turns up, please return the DVD to us in the pre-paid envelope. Theft of our DVDs is mail fraud, which is a felony that carries a sentence up to five years in prison and/or fines up to $250,000. U.S. Postal Inspectors investigate any crime in which the U.S. Mail is used to commit fraud. If evidence of a postal violation exists, Postal Inspectors may seek to prosecute the violator. 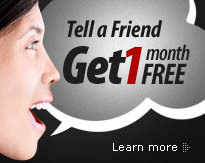 Active members get 1 month of FREE service anytime someone they refer signs up. Members must use the "Tell a Friend" email form to qualify, and your friend cannot already have an existing account. When they stay remain a member one month past the first month, we'll credit your account with a free month of service. If you don’t have a DanceFlix account, you can still use the tell-a-friend feature. You may not qualify for the free month of service, but you’ll be helping your friends by telling them about our invaluable service. Can I publicly display the video at my dance event or vendor table? No. The DVDs you rent from us cannot be legally displayed publicly without permission from the copyright owner. These are called “performance rights” and are not granted to DVD purchasers or renters. Neither DanceFlix, nor the renter, are allowed to publicly display the DVD video. To do so is unlawful. Yes. Just like Blockbuster, Netflix, Redbox and your corner video store, it is perfectly legal to rent out lawfully acquired, original copies of DVDs. This is clearly outlined by the first-sale doctrine of the U.S. Copyright Act. We retain the legal services of Washington D.C. Law Firm specializing in copyright and anti-competitive practices. We are well aware of our rights and actively defend ourselves against false accusations.